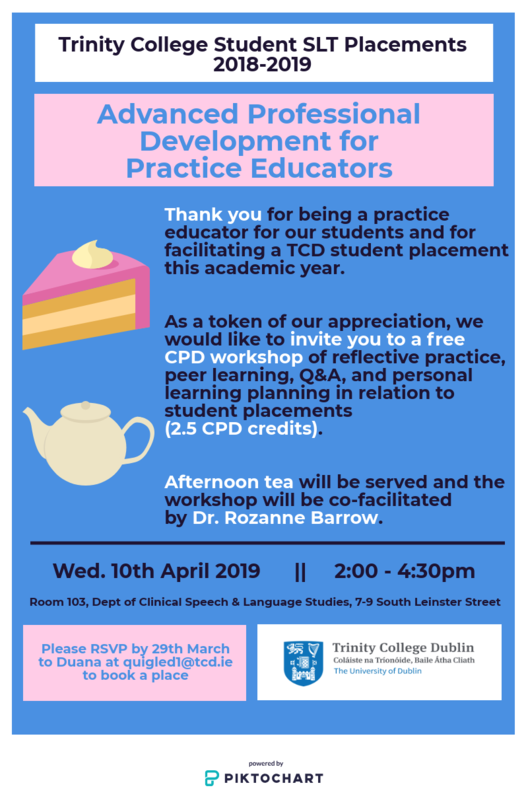 This free Advanced Professional Development workshop is offered to Practice Educators who facilitated a TCD student placement in academic year 2018/2019. Your commitment to sharing your professional knowledge and skills and nurturing the next generation of speech and language therapists is really valued and appreciated. Join us for an afternoon of reflective practice, peer learning, and personal learning planning about student placements (2.5 CPD credits). Afternoon tea will be available and the workshop will be co-facilitated by Dr. Rozanne Barrow.